That is really useful, here's a list of reasons why! I don't actually have a list. This is just really cool. I forgot how to invite someone to a topic, can you guys help me? On mobile it's at the bottom of the topic under "Topic Controls"
On desktop it's right next to the reply button. You just type in the name of who you wanna invite. is there a PM option I don't know my way around the site and I have a question. All you have to do now is type in Eljay's name into the Add a user box, fill in a title in the box below it, and add in your question in the large box below that. The likeliness of him answering the PM question is less than a question asked in the AMA, though. How do you upload an audio file in a post? You can link to audio files on Dropbox or SoundCloud. The Boards should automatically embed the audio. Does anybody know how to onebox? Are you trying to interface Onebox with the Boards? No, onebox, as in the badge. Oh, oneboxing refers to when you post the text form of a link, i.e. It happens anytime you link to another boards topic with no spaces before the link, plus it affects some other sites I think. plus it affects some other sites I think. YouTube, Amazon, and I think a few others. Hey there! I recently saw that there exist the exist the reader badge. To take it, I need to read a topic with at least 100 posts. Do you know a topic with at least 100 posts? Can you link me it please? I will be very happy if you do it, and if that post will have tons of images. Do you know a topic with at least 100 posts? Can you link me it please? 1- Open the search bar and click on "options". 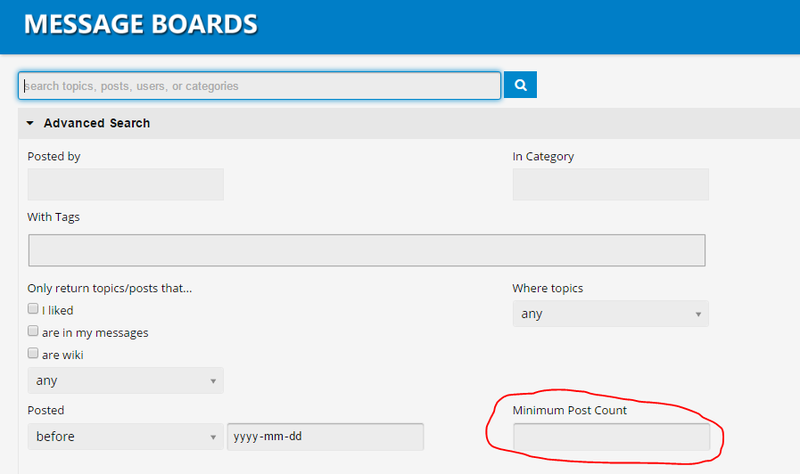 2- Make the "minimum post count" as high as you want and then make a search. I really need to read them all or just I can see them?